Whole moong dal is also known as green bean they are small cylindrical beans with bright green skin. Moong beans could be prepare spli with skin or washed without the skin with so many different ways. 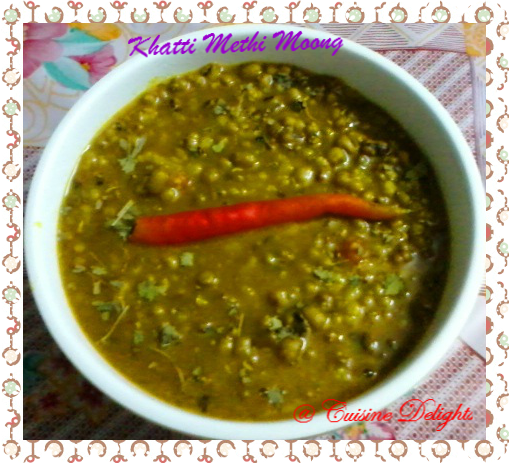 moong dal is one of the tasty and good sources of essential nutrients and protein. This dal is a great combination with chapattis. Wash and soak moong beans at least 1 hour. Pressure cook with 3 cups of water for 4-5 whistles on medium heat or till cooked well and become soft. Open the cooker and mash slightly and then add 3 cups of warm water. Now mix all the spices and chopped ginger and green chilli, cook on medium heat for 10 minutes and then simmer for 15 minutes. Keep stirring in between. Now remove from the fire and add dry methi powder and ghee, mix well.